It is time to embrace the women that make women’s golf a little more interesting, even if they are better known for their looks rather than their games. Beatriz Recari Eransus is a Spanish professional golfer on the U.S.-based LPGA Tour and the Ladies European Tour. Born on 21 April 1987 in Pamplona in northern Spain, Recari began playing golf at age 11 and enjoyed a successful amateur career, with wins at the 2004 Spanish Amateur Championship and the 2005 French Amateur Championship. While studying economics at the University of Navarra in Pamplona, Recari qualified for the Ladies European Tour in November 2005 and turned professional at age 18 for the 2006 LET season. Born on 29 June 1990, Ryu So-yeon, is most beautiful South Korean professional golfer. 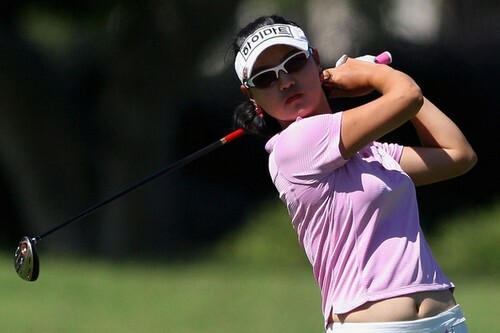 Yeon plays on the LPGA Tour and on the LPGA of Korea Tour. She won the 2011 U.S. Women’s Open. Ryu turned professional at age 17. Her first win as a professional came in February 2008 on the American Cactus Tour, in which she won by six strokes. She then joined the LPGA of Korea, winning the first event she played, the Sports Seoul Open. Ryu took classes at Yonsei University while also competing full-time on the LPGA Tour. She graduated in February 2013 with a degree in sports business. Charley Hull, born on 20 March 1996, is an English professional golfer who achieved success during her 2013 debut season on the Ladies European Tour, winning honors as Rookie of the Year and becoming the youngest competitor to participate in the international Solheim Cup. Hull came to public attention aged 9, when she won the UK National Ladies Championship at Turnberry. Aged 10 she played alongside Morgan Pressel in the British Open Pro-Am. She won several amateur events in the United States and Great Britain and has ranked in the top-10 of the World Amateur Golf Ranking, reaching a high of number three in the world. She has won Ione D Jones/Doherty Championship, Welsh Ladies Open Stroke Play Championship, English Women’s Stroke Play Championship in 2011, and 2012 Harder Hall Invitational. Creamer was born in Mountain View, California, on August 5, 1986. She participated in acrobatic dancing and gymnastics during her childhood, and started playing golf when she was 10 years old. At the age of 12, she won 13 consecutive regional junior events in northern California, and the following year she became the top-ranked female junior golfer in the state. She turned professional at the age of 18. As a professional, she has won 11 tournaments, including 9 LPGA Tour events. Creamer has been as high as number 2 in the Women’s World Golf Rankings. She was the 2010 U.S. Women’s Open champion. Ekey is an American female professional golfer currently playing on the LPGA Tour. She was born in Cleveland, Ohio on November 8, 1986. Ekey turned professional in 2009, and joined the Futures Tour on July 14, 2009. In 2011, she finished at the top of the Futures Tour official money list and was named the Tour’s Player of the Year. Anna Rawson the most beautiful woman in sports. The 2nd Australian beauty in our list of ten most attractive women golfers. Born in Adelaide, Australia, on 5 August 1981, Rawson is a professional golfer and model. She got her break into a modeling career at age 16, when she was a finalist in the Australian “Dolly” Magazine cover contest. At the age of 17, she started as an amateur golfer in Australia, and won the Jack Newton International Junior Classic. Rawson turned professional at the end of 2004. She played on the Ladies European Tour and the LPGA Tour. One of the most attractive women golfers – Nikki Garrett, born on 8 January 1984 is an Australian professional golfer. She turned professional in 2005, and qualified for the 2006 Ladies European Tour (LET). She did not win a tournament in her rookie season, but she had four top-ten finishes, ended up 12th on the Order of Merit standings with €99,445 in earnings, and won the 2006 Ryder Cup Wales Rookie of the Year award. In 2007 she collected back to back LET titles at the Tenerife Ladies Open and the Open de Espana Femenino. Natalie Anne Gulbis is an American professional golfer of Latvian descent who plays on the U.S.-based LPGA Tour. Born and raised in the Sacramento, California, area, Gulbis started finding interest in the game at the early age of four. By the time she reached age seven, she had won her first tournament, and at age ten, she reports she was breaking par. She played in her first LPGA Tour event in 1997 as an amateur at the age of 14 (handicap of 2). Her first professional win came at the July 2007 Evian Masters in France, where she defeated Jeong Jang in a playoff. Blair O’Neal is an American Professional Golfer. Blair was born May 14, 1981 in Macomb, Illinois and moved to Arizona at the age of two where she spent the rest of her childhood. At an early age Blair enjoyed ballet, jazz and cheer. She first appeared on the Golf Channel series The Big Break during the Big Break Prince Edward Island season. And she fared pretty well, finishing as runner-up. In 2010, O’Neal returned for another season, appearing as a cast member of Big Break Dominican Republic, where she won the title. Born in Moscow, Russia, on 27 March 1986, Maria Verchenova is one of the hottest imports in the game today. She is the first Russian to become a full-time member of the Ladies European Tour. She has several top-10 finishes.